Foam Crafts are a Great Birthday Party Idea. Colorful, inexpensive and a momento of the birthday party. 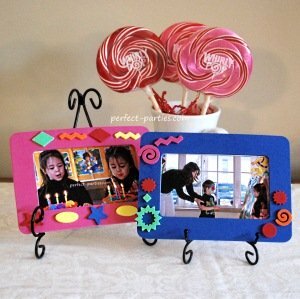 Make a birthday party frame and send home a photo of the party. Take a quick group shot or individual pictures with the birthday girl. Decorate according to the theme of the party by changing the stickers or colors and decorative items. Rhinestones, glitter glue, small silk flowers, buttons, puzzle pieces, paint. Select photo and print on photo paper or copy paper. Cut photos with a border to make it easy to affix to the back of the foam frame. Decorate the frame with markers, stickers and glitter glue if there is time for it to dry. Attach picture to the back of the frame. Hot glue a magnet to the back (optional). My daughter just came back from a birthday party with this craft with a picture of the entire party. What a cute picture idea! 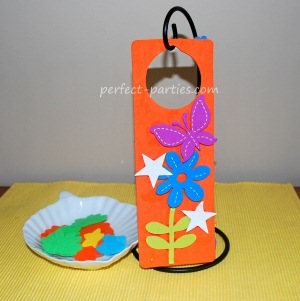 Make a birthday party foam door hanger as a cute make and take. Decorate according to the theme of the party by selecting the theme colors of the party for the door hanger. Buy stickers or and decorative items to match the theme of the party. Rhinestones for princess parties, shells and sand for ocean themes, etc. You could even add a photo of the party. Aleene's Fast Grab Tack Glue (recommended and usually found at Craft Supply stores) for gluing on objects like rhinestones, buttons and other small items. Rhinestones, glitter glue, small silk flowers, buttons, puzzle pieces, paint, party photos. Make a birthday party visor and decorate it with paint pens, foam stickers, and glitter glue. Decorate according to the theme of the party by selecting the theme colors of the party for the visors. Buy foam stickers to match the theme of the party. Paint pens are great for older children. Please read the directions on the pen carefully to make sure it is used properly. Decorate the frame with markers, stickers and glitter glue. Gluing on items is not recommended as it can make the visor heavy and not stay up on the head well.